While Silicon Valley shoots for total mixed reality immersion, the 500-person strong North (previously Thalmic Labs) has spent five years in Waterloo, Canada building Focals, a pair of $999 stylish, everyday smartglasses. Focals are in many ways what you wanted Google Glass to be. They use an invisible holographic display that can show subtle overlays like incoming text messages and turn-by-turn directions with voice and visual interaction via a special version of Amazon's Alexa voice assistant. 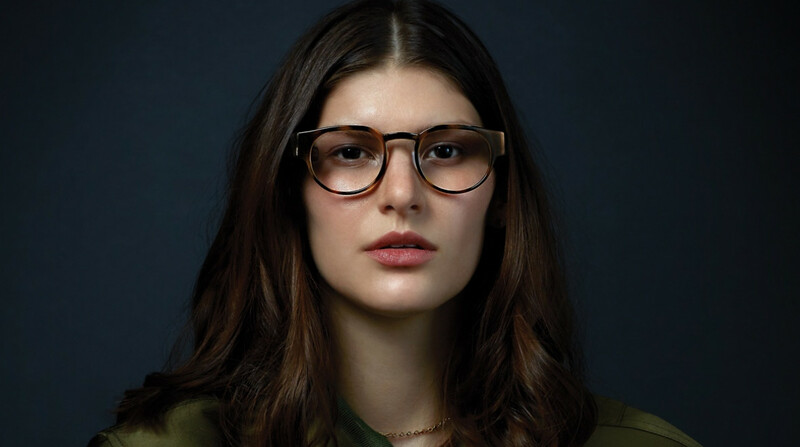 The smartglasses are available in Classic and Round styles, three colours – Black, Tortoiseshell and Grey Fade – and both prescription and non-prescription lenses. And North tells us you'll get a day's regular use (up to 18 hours) out of the smartglasses with three extra charges thanks to the charging case. Focals work with both iPhone and Android phones, connecting via Bluetooth. North built the retinal projection technology inside Focals itself and North's CEO Stephen Lake stresses that you don't see a rectangle screen. Instead you see minimal, 2D elements floating around a metre in front of you as per the promo video – "it's very subtle, a single almost subtitle floating in the world". The benefits of the projection tech are the smaller form factor and the fact that it looks invisible to people around you. "Inside the glasses on the right side, there’s a tiny, highly precise projector," says Lake. "That projector has an incredible number of precise optics inside that outputs a ray of light, a spot from the projector that’s two microns across, a very tiny, precise spot that scans out of the glasses onto the holographic element on the prescription lens. We’re sending out little rays of light and pixel by pixel, it reflects off that holographic element directly onto your eye." What's different here to what we've seen before is down to the work North was doing before it decided to rebrand. As Thalmic Labs, it was known for its Myo gesture control armband, which the company recently announced it was killing off. Here, the Focals are designed to be used with a bundled accessory, the Loop smart ring. Without it, you'll see alerts but you won't be able to interact with the glasses – there are no touch controls. Another lesson from Google Glass? No camera. "The Loop has a five-way joystick on it and it’s really the optimal interface for this product," says Lake. "We spent a lot of time, even back to our Myo days, looking at the best interface for this type of product, everything from voice to touchpads on the side to wristbands to armbands. The amazing thing about the Loop is it’s incredibly discreet – it’s one handed, single clicks, there’s no large motions, you’re not moving your hands, touching the glasses or anything, nothing that's not socially acceptable." There are only a handful of features ready for launch but that may be no bad thing considering Focals are designed to be invisible most of the time. These include Communication – viewing and replying to messages via Google voice or custom replies; Go – searching and getting turn-by-turn directions to local places and restaurants via MapBox navigation and Foursquare recommendations; and Day To Day – which includes calendar, weather and news. The two partner apps for launch are Uber, which works as you'd expect, and Alexa. It's worth noting that Amazon is an investor in North, alongside Intel. "We worked on an amazing version of Alexa with them that’s tailor made for the glasses," says Lake. "So largely visual responses, not just hearing but popping up in the right design language. We used some of the work developed for display devices in the home but we’ve been working with Amazon to go further and actually create more skills that have great visual responses." The Focals are customised to each wearer's eyes and head, using 3D scanning technology that North developed, then delivered to the customer. So they'll only be available, at least initially, from North's new showroom stores in Brooklyn and Toronto. The non-prescription Classic styles will ship by the end of 2018 with the Round frames and prescription lenses coming in 2019. While I wasn’t treated to the full face and eye scanning experience because we were in Thalmic’s San Francisco headquarters rather than one of its stores, I did get a small taste. They used a scanner and a tablet to check my eyes as I watched dots dart around a screen. I was then fitted for a ring. Once those steps were complete I was ready to hop in. Using the Focals is comfortable, largely because the control system is relegated to the Loop smart ring, which has a tiny nub of a d-pad where you can scroll through the interface. Using a ring instead of putting touch controls into the glasses makes things more comfortable while using it, and you won’t have to bring up your arm every time you want to do something. You also don’t have to use voice, which is a boon because sometimes you don’t want to do voice controls out in public, like in a library or on a packed train. You can also click the Loop to do things like activate the projector and go to the home 'screen'. The click itself is fine, but what makes it really satisfying is the accompanying sound effect, which sounds a lot like Nintendo’s Switch sound. The interface is set up in a row with the home screen up first. This screen actually changes based on your day, like your calendar will pop up here with your next event. Or if you’re in the middle of navigation mode, you’ll see your directions. You simply scroll to the right to get to the other interactions, which include maps and calendar and messages. It’s all a breeze to get used to, and the UI is nicely laid out in a purple-ish hue that stands out against most backgrounds. I wasn’t able to try the Focals outside, so it’s hard to say whether it’ll look as good in bright sunlight, but it looked great indoors. North tells me that the brightness will automatically adjust to the light. The interface disappears after a couple of seconds of non-use, and it pops back up with a quick press on that ring. Sound coming from the glasses is good indoors, but again it’s hard to tell how it’ll stack up when outside on a busy street. The space where the interface was projected was in a good spot. I was still able to speak to other people while it was up, but it wasn’t all over their face and blocking my view. And again, it does a good job of getting out of the way when you’re not using it by, well, simply fading away. The precise position of the interface is customised by your facial scan. Now, I wasn’t treated to the full scan and still got a good position. It could just be that my face and eyes are spaced generically or fit won’t be an issue for most people. The glasses were comfortable and light on me, and at one time I forgot I was wearing them. There are a couple of potential pitfalls here though. Walking with the Focals on takes some getting used to. Not because they affect your walking, but because you’ll want to be using the thing and scrolling through your messages while you walk. That’s not wise. It’s not as bad as staring at your phone, which is what Focals could partially replace, but it is still distracting. What matters is how quickly you could get used to this experience in day to day life. When we mention Magic Leap, North's CEO contrasts what it's trying to do with Focals with the "ridiculous form factors" of AR headsets and goggles designed to be used in the living room. He's not planning to make a play for "distracting" entertainment anytime soon but that doesn't mean Focals aren't exciting. "These big, bulky AR products are designed to distract us from the world and what’s around us," Lake says. "Productivity is one way to think about [Focals]. There will be elements that are ‘fun’, I don’t want to make it sound like we’re designing this to be as utilitarian and boring as possible. But it is first and foremost about how these apps give you utility and value and a product that can be useful to you. And then there are ways to make that experience light and fun." If that's enough to tempt you, you can pre-order Focals by North for $999 here. why doesn't Samsung make it so we can read our ebooks and PDFs on our watches!!! It's so infuriating only getting part of a news story!!! !